During the foundational elementary years of rapid growth, from kindergarten through fifth grade, the goals and standards of the Duffy Art program are sequenced to establish and continuously build upon each student’s emerging technical, analytical and creative skills as twenty first century thinkers. Building upon the National Standards Document adopted by the Secretary of Education and published by the National Art Education Association in 1994, Duffy art teachers engage in an ongoing process of creating relevant, rigorous and developmentally appropriate art experiences for our students. Applying art materials, techniques and processes. Recognizing and employing the elements and principles of art and design. Describing, analyzing and evaluating subject matter, symbols and ideas. Recognizing and making connections to the history of art, and art’s relationship to, and across, diverse cultures. Critically assessing individual works of art, and making reasoned, aesthetic judgments of general issues and concerns in art. Finally, it is the foremost goal and expectation of the Duffy art teachers that every student make connections between themselves and the visual arts that are meaningful, relevant, enduring, and appropriate to their unique moment of development as individuals, as learners and as community members. The instrumental music program is a voluntary program open to 4th and 5th grade students. Lessons on band and orchestra instruments are offered weekly for one half hour, with 4th grade string students receiving two half hour lessons each week. The goal of the program is to allow students to apply skills previously learned in vocal music, as well as to develop new musical skills specific to an instrument. In addition to weekly lessons, students participate in performing groups. Our school string orchestras and bands rehearse once a week before school, and perform two concerts during the school year. During these rehearsals, students are exposed to literature at various levels, develop group learning skills, and apply individual musical skills within a performing ensemble. Parents of younger children with instrument experience may participate in the before school ensembles. Contact Mr. Thomas for more information. I look forward to your child’s participation in instrumental music at Duffy!
" The instrumental music program is a voluntary program open to 4th and 5th grade students. " 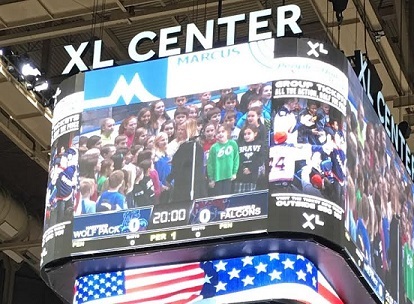 The goal of the vocal music program is to instill a love of music in every child, develop the innate musicality of every child and foster music literacy. Singing is the primary foundation of the child’s musical development. Just as children learn language by hearing and imitating speech, they learn to match pitch and sing in tune in the music classroom. This develops the musical ear, fosters artistry, creates a sense of community and is the springboard for teaching musical reading and writing. This training then prepares these musicians for their instrumental lessons in fourth and fifth grade with Mr. Thomas, our instrumental teacher. In every class, children sing a wonderful, diverse repertoire of authentic folk songs and composed music. 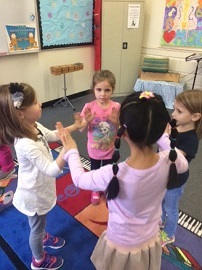 As the children are singing, they are joyfully engaged in the music making process by moving, creating, performing, improvising or listening to art music as well as reading and writing. 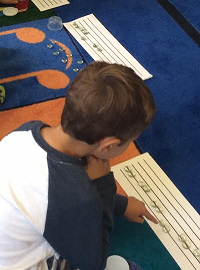 These concepts are just a few of the many activities artfully woven through each music lesson. The children have vocal music class twice a week for 30 minutes. 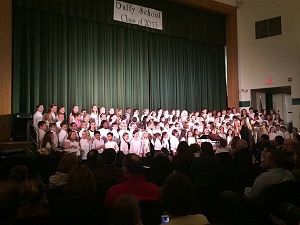 In grades four and five, children are encouraged to participate in the choir, band and orchestra. Each group rehearses before school and performs a winter and spring concert. It is a wonderful opportunity for the children to further develop their musical skills and experience the joy of performing in a large group. Our fourth grade choir rehearses on Tuesday mornings and our fifth grade choir rehearses on Thursday mornings. Both rehearsals begin at 7:45 in the music room. As the concert date approaches, both groups join and rehearse together. Changes to rehearsal schedule will be noted in the Duffy dateline. There are many ways to reinforce what your child is learning in music class. Listen to many different styles of music, attend concerts or encourage your child to share a song, folk dance, composer, singing game or concept that we are working on in class. Help their music education come alive in your homes! The philosophy of Duffy School’s physical education program is to provide appropriate instruction that maximizes an individual’s potential for developing and maintaining a healthy body, mind, and character. This program will help students develop basic skills of efficient movement through a variety of activities common to lifelong fitness. Students will learn to create a quality lifestyle that encourages skill development, health-related fitness, cognitive concepts, social characteristics, and emotional development. Due to the obesity epidemic, which has become a national health crisis, with annual health care costs over $150 billion, Physical Education is gaining momentum again and its value in schools is more important than ever. In fact, First Lady Obama, in recognizing the need for children to move more and eat better, has started a national campaign called LETS MOVE. Along with rising obesity rates, the rate of prescription drug use by children for diabetes, high blood pressure and high cholesterol is increasing. Obese adolescents have significantly greater risk of developing and dying from chronic diseases in childhood. Of all U.S. deaths from major chronic diseases, 23% are linked to sedentary lifestyles. Children’s physical activity level drops dramatically between the ages of 9 and 15. Evidence suggests that physical activity has a positive impact on cognitive ability, avoiding tobacco use, insomnia, depression and anxiety. Several large scale studies found improvements in students’ academic performance with increased time spent in physical education. Regular physical activity is associated with a healthier, longer life and lower risk of CVD, high blood pressure, diabetes, obesity, and some cancers. Together with other healthy lifestyles choices, such as better nutrition, we can have a positive impact on student’s education and a way to improve life-long and well-being. ¡Bienvenidos al mundo de Español en Duffy! Third graders are introduced to greetings, colors, numbers 1-30, days of the week, months, weather, seasons, emotions, classroom objects, body parts and healthy eating. Fourth graders spend the first few months reviewing topics from third grade, which include: colors, numbers 1-50, days of the week, months, weather, seasons, and emotions. They are introduced to clothing, basic body parts, the alphabet, and healthy eating. Fifth graders spend the first two months reviewing topics from third and fourth grade, which include colors, numbers 1-1000, days of the week, months, seasons, weather, clothing, emotions, and classroom objects. They study about Hispanic Heritage including all 20 Spanish speaking countries their cultures, and families. Fifth graders are introduced to family, household objects, sports, and telling time. The 3rd through 5th grade World Language Program is designed to enhance students’ communicative skills in the Spanish language, while fostering knowledge and understanding of other cultures and disciplines. My name is Andrea DeSimone-Rafferty. I completed my undergraduate work in Spanish Language/Literature at Salve Regina University and the University of Madrid. In 2010 I received my Master’s degree through the Inter-University program at The Universidad of Salamanca in Spain and CCSU. I have been a language teacher for 20+ years, 5 of which were spent instructing in Madrid and Barcelona Spain. I joined the West Hartford School District in 2005. When my husband and I are not juggling the trials of raising two teenage boys, I enjoy cooking, reading, walking, listening to music and getting together with friends! During the summer my family travels to visit family and friends throughout Spain.